GAINERÓW ONE OF THE BEST ON THE MARKET! 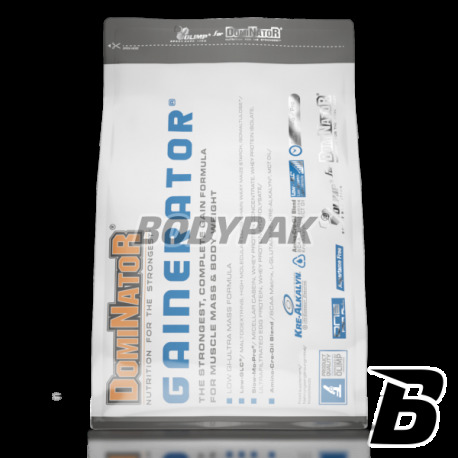 Olimp Dominator Gainerator - advanced, comprehensive composition of properly compiled carbohydrates and animal proteins that work synergistically to make your muscles will simply explode as a result of saturation with nutrients. This is guaranteed by two ultra-modern formulas - energetic and building block, which is perfect Low-GLC ™ and Slow-Mo-Pro ™, designed for the best, with a view to their success ... but only the toughest can tame the powerful anabolic effect. Check on what really you can afford! The more that they have been reinforced with a powerful portion of L-glutamine and branched chain amino acids (BCAA) and buffered creatine monohydrate Kre-Alkalyn® and MCT oil. The anabolic power of Low-GLC ™ and Slow-Mo-Pro ™ has been intensified to the limits of the human body, making regeneration and growth has not never been so easy. Excellence Gainerator are nuances in its composition, chosen unmatched, diabolical composition, by the best scientists from Olimp Laboratories. Low-GLC ™ (poly- and oligosaccharides, long-chain waxy maize starch Waxy Maize, isomaltulose) - an innovative combination of carbohydrates with a low glycemic index, and appropriately selected, mutual profiles speed digestion and release of sugars into the bloodstream. The innovative formula of Low-GLC ™ is based on the assumption of optimal saturation of blood with monosaccharide providing an uninterrupted source of energy to continue long-term effort of sport with the highest intensity, as well as effective regeneration immediately after its completion. Aptly chosen, high-quality sources of carbohydrates, characterized, above all, low and medium-low glycemic index ensure maintaining insulin concentration in the blood at an optimum anabolic level. This protects the exercising person against decline in motivation to exercise during his lifetime, constantly supplying energy to the effort at its best. It also prevents the reduction of insulin receptor sensitivity to the hormone, which may be the case where the supply of high amounts of sugars. Carbohydrates included in the formulas Low-GLC ™ are an unfailing source of energy after 30 minutes since the adoption of (poly- and oligosaccharides), up almost 4 hours (long-chain waxy maize starch Waxy Maize and isomaltulose). This ensures that overcompensation nutrients already in the moment after training, maximizing the processes of rebuilding energy components. The addition of MCT oil and pioneer in its absorption, patented, buffered creatine monohydrate (Kre-Alkalyn), aims at intensifying and shortening to a minimum the duration of the regeneration phase, so that following the training, growth and adaptation of load muscle tissue could be done without further obstacles. The strength and beauty of excellence selection of protein sources is Slow-Mo-Pro ™ (micellar casein, whey protein concentrate, whey protein isolate, egg albumin, whey protein hydrolyzate). You can not give it - check how the laughs in Slow-Mo-Pro ™ power! The more that the formula was composed based on the latest scientific research and creates a complex of various protein sources, each of which has a different speed of digestion kinetics and releasing amino acids into the bloodstream. The perfect protein blend ensures the highest blood saturation with protein digestion products within 15 minutes from the time of its administration (whey protein hydrolyzate), and a high and stable level, maintains the state for 6 consecutive hours (whey protein concentrate, whey protein isolate, albumin egg, micellar casein). Carefully selected quantities and types of protein sources used in formula Slow-Mo-Pro ™ ensures the most desired for muscle regeneration, amino acid profile. It is particularly rich in branched chain amino acids and 8 essential amino acids for proper growth and regeneration, which in large quantities are released during the assimilation Slow-Mo-Pro ™. This ensures maintenance of the highest anti-catabolic effect, both during intense exercise and immediately after it. In such favorable physiological conditions of post-training regeneration it will occur at peak performance. But this is not all that Slow-Mo-Pro ™ offers. Whey protein isolate and micellar casein will additionally reveal their high potential in the lipolysis process intensification to free your body from excess fat. Catabolism is not threatened, because it is Slow-Mo-Pro ™ and ... BCAA ... and L-glutamine! In addition, more than 4 g of free branched chain amino acids (BCAA) per portion and over 3.5 g of high quality L-glutamine guarantees reaching in every cell of skeletal muscle athlete, a highly parameterized catabolic environment to protect the metabolic integrity of each struck by catatonic training muscle fibrils. Since the launch of Gainerator ™ even the longest and most exhaustive training sessions will not lead you into catabolism. A complex of as many as 12 vitamins added to Gainerator ensures effective action of all enzymes involved in the metabolic changes in the regeneration and growth of muscle tissue. Vitamins and minerals absolutely must be completed, since their loss during intense effort is great and significantly reducing the quality of all biochemical processes in the body of the athlete. You can not afford it! Supplying selected vitamins from Gainerator ™ guarantees intensification of the anabolic effect resulting from the presence in the blood of high concentration of amino acids and carbohydrates from digestion of both ultra-modern formulas - Low-GLC ™ and Slow-Mo-Pro ™. Additionally, a high anti-oxidising potential provided by some vitamins helps maintain a low level of free radicals that are massively created in muscle cells during intense exercise. Gainerator ™ is fully synergistic action of the individual components. 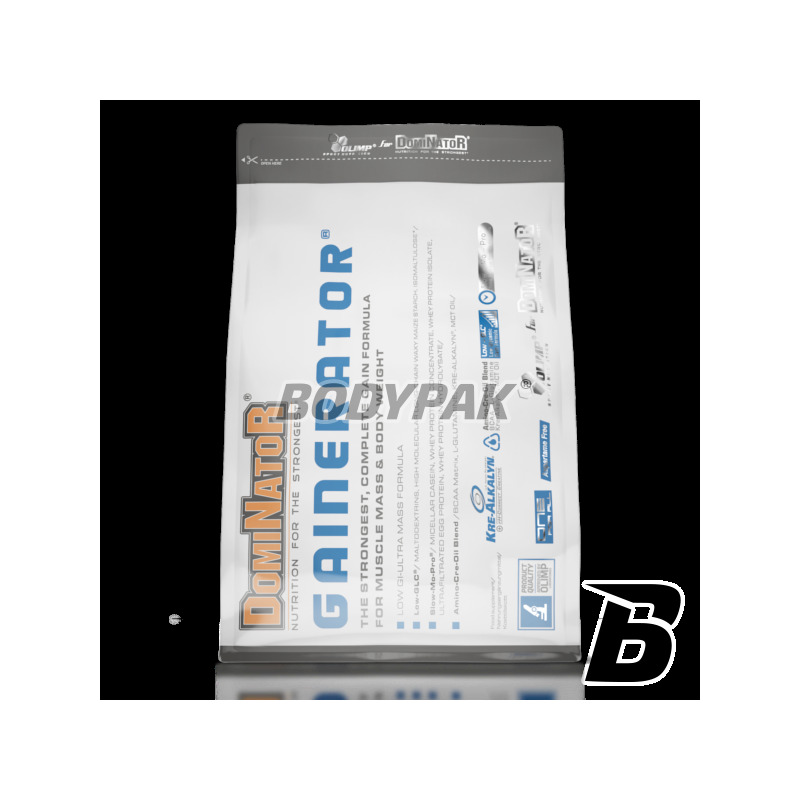 Gainerator ™ is the ideal choice for bodybuilders and gym enthusiasts, for whom building and maintaining high quality muscle mass is a priority. Gainerator ™ based on carbohydrate sources with the lowest GI and protein sources with a long absorption time, taken additionally between meals or as a replacement for one of them, ensuring a constant supply of anabolic nutrients. Gainerator ™ is also an ally of people having problems building high quality musculature, without an excessive amount of body fat (endomorphists) and each person who seeks to increase the level of their musculature. Gainerator ™ in itself is a perfect blend of highest quality nutrients and regulating ingredients, so it does not require combining with any other product of supplements or conditioners [ONE FOR ALL formula]. Gainerator composition ensures optimum absorption of sugars and amino acids into muscle cells, which is crucial in achieving success in any sport. 1-3 portions a day - between meals and approx. 1 hour. before and after training. 1 serving (80 g - 180 units = 5,5 scoops or 9 flat tablespoons) dissolved in 250 ml of water. 1-2 portions a day - between meals. 1 serving (80 g - 180 units = 5,5 scoops or 9 flat tablespoons) dissolved in 250 ml of water. Ingredients: 70% Low-carbohydrate preparations GLC® (maltodextrin, long-chain waxy maize starch Waxy Maize, isomaltulose *), 21% protein Slow-Mo-Pro® (micellar casein (with milk) , whey protein concentrate (milk) whey protein isolate (milk) albumin, egg protein, whey protein hydrolyzate (milk) ) , flavors, BCAA branched amino acids (0.6% L-leucine, 0.3% L-isoleucine, 0.3% L-valine), 1.2% L-glutamine, 1% MCT oil, thickener - xanthan gum , sodium carboxymethylcellulose; 0.7% buffered creatine monohydrate; acidity regulators - malic acid, citric acid (for all kinds of strawberry flavors); anticaking agent - silicon dioxide, a sweetener - sucralose, 0.01% vitamins (L-ascorbic acid - vitamin C acetate, DL-α-tocopheryl - vitamin E, nicotinamide - niacin, D-biotin, retinyl acetate - vit. A, calcium D-pantothenate - pantothenic acid, pyridoxine hydrochloride - B6, cholecalciferol - vitamin D, folic acid - folate, thiamine mononitrate - vit.B1, -wit.B2 riboflavin, cyanocobalamin - wit.B12), colors: cochineal (for all kinds of flavors: strawberry, strawberry-kiwi, cherry, cherry-banana), E 150c (for all types of toffee, chocolate, ice coffee, tiramisu, coffee, cappuccino, hazelnut), riboflavin, E 133 ( for all types of flavors, pistachio). Smakuje dobrze i tak też się rozpuszcza, próbowałem wielu sposobów na rozbudowę masy mięśniowej i dopiero z gaineratorem mi się udało, polecam. Rewelacyjny skład, duża zawartość białka i niewielki stopień cukrów. Polecam! Trochę drogo jak na gainera. Rozpuszczalność również nie zachwyca. Jedyny plus za smak.